The Windshaft is a large shaft of wood into which the metal sail canister box is set at one end. The Canister has two holes running through it into which the Sail stocks are set. Two thirds of the way down the Windshaft the Brakewheel is attached, and the whole structure is placed in the mill cap at an angle with the canister protruding from the front of the cap. The Windshaft must be able to rotate freely to allow the rotation of the sails to be bought into the mill where the Brakewheel meshes with the Wallower. The wooden Windshaft at Wheatley had been exposed to the elements when the cap collapsed and in places it had begun to rot. When the restoration began it was removed from the mill and placed into storage. With the new cap being built the time had come to repair the Windshaft in preparation for refitting it into the mill. The Windshaft was taken to Chris Wallis's workshop for the reconditioning work. Once there the metal bands that strengthen the structure were taken off and the canister box was removed. Then all of the rotten wood was removed and new pieces of wood were bonded into the Windshaft to replace it and all remaining cracks were filled. Here are photos of the reinforcement tube, used to conserve the weak end of the Windshaft, and the canister being fitted at Chris Wallis's workshop. Once this was completed the canister box and bands which had been inspected and cleaned were added back onto the Windshaft. The whole assembly was then put through a series of tests with the bearings mounted in the new cap to test the angle and position of the shaft. Once it this was calculated and it was assured that the shaft would rotate freely so that the sails would not catch on anything the reconditioned Windshaft was ready. 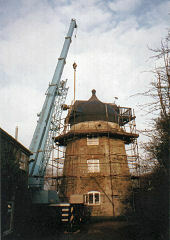 On the Jan 11th 2002 the reconditioned Windshaft returned to the mill and once again a crane was seen moving into position next to the mill house. The shaft was then lifted into the mill, tail first through the opening in the front of the cap and into position on its bearings. The Windshaft in 1996 before restoration. Loading the Windshaft onto a trailer to take to Chris's workshop. The removed canister box which is marked "Eagle Foundry 1784". The repaired windshaft being installed on its bearings as a test. 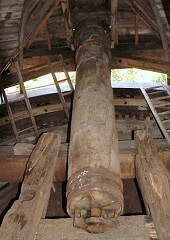 A view of the incomplete Cap and repaired Windshaft. Note the still to be fitted Windshaft bands on the right. 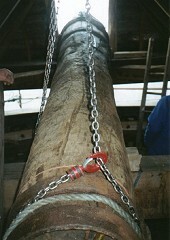 The fully repaired Windshaft arrives back at the mill at the end of 2001. Chris Wallis and the crane driver prepare to lift the Windshaft. Up it goes, as the lift commences. The Windshaft is manouvered into the Cap through the front dormer. A view of the crane with the Windshaft almost in position. The Windshaft back in its place awaiting the removal of the lifting chains. The refitted Windshaft fastened in its bearings.